Life as a young adult in New York City is not always the easiest. With salaries that barely cover the expenses many of us have to deal with: overpriced rent (it's too damn high), student loans (ugh), and nights out (what is the point of living here otherwise?) along with busy, hectic work days - it is difficult to source the funds and find the time to escape from the crazy city we love to call home. However, it is absolutely necessary. You need to leave the city in order to really appreciate it; space and serenity can also bring some peace of mind that is sometimes impossible to find in a big city. 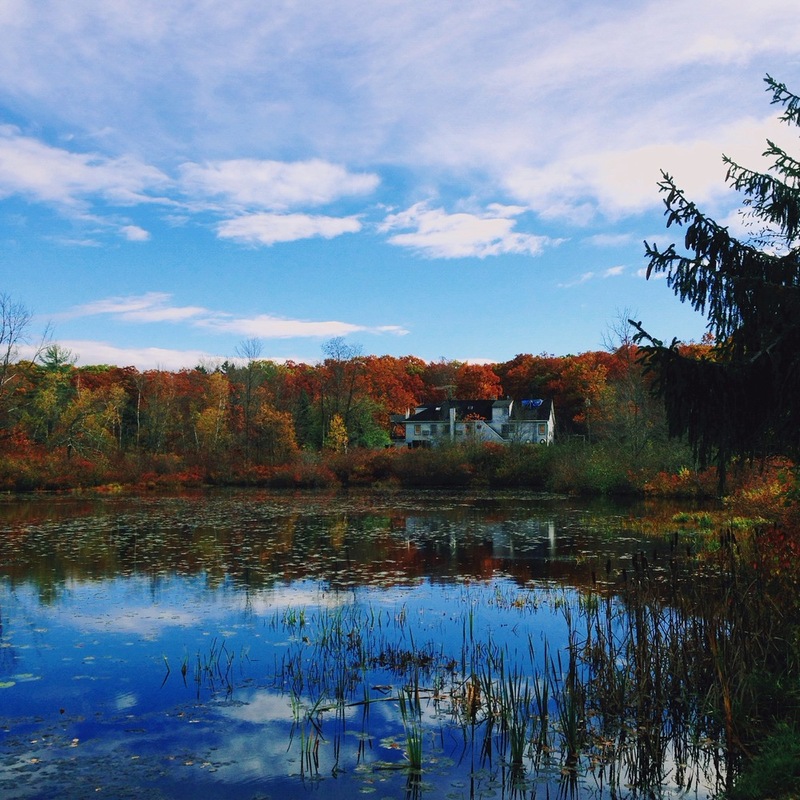 So, with a desire to temporarily escape from the city's madness and explore a new campsite, Firelight Camps, known for taking camping and transforming it into an activity that can be done in luxury, my good friend, Gloria Cavallaro of The BLVD and I prepared for a road trip upstate to Ithaca, New York. Using the website, Roadtrippers, Gloria and I were able to find points of interest on our way to Ithaca. 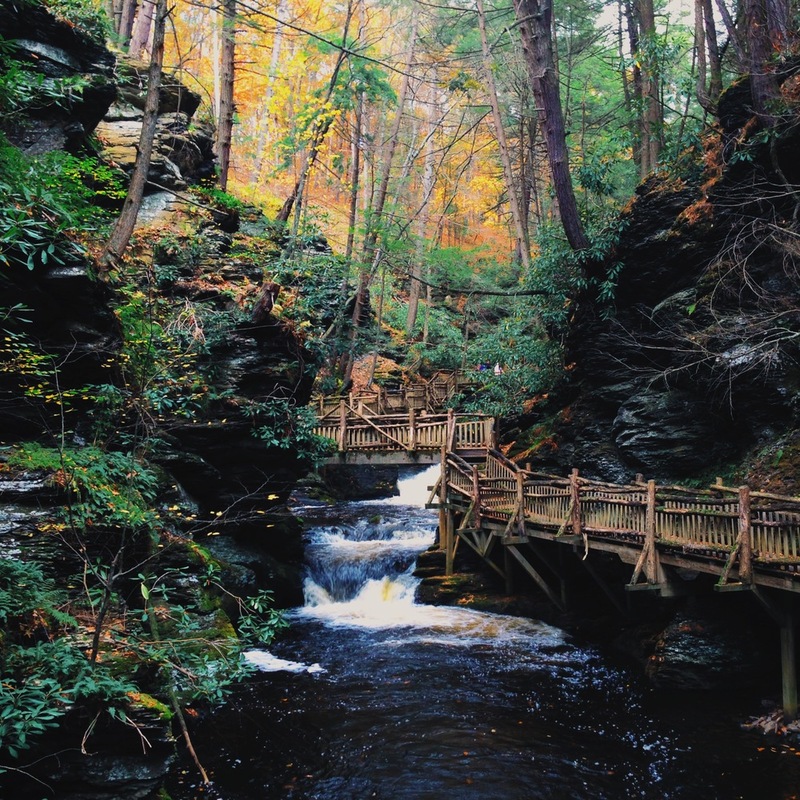 One that stuck out the most was Bushkill Falls in Pennsylvania, which promised beautiful nature filled scenery and pleasant trails to hike through. In order to spend a lot of time exploring the area, rather than taking many stops and getting to our main destination very late, we made this our only detour en route to Firelight Camps. It was definitely more than enough to feast our thirst for beautiful terrain as well as our desire to exercise enough to make sitting in the car for a few hours a much easier feat. A few breakfast sandwiches, iced coffees, and two hours on the road later and Gloria and I had finally made it to Bushkill Falls. Back in New York, it was difficult to decipher the season due to inconsistent temperatures and a lack of flora, but in Bushkill you could definitely tell that autumn was upon us. We were surrounded by trees colored with varieties of warm reds, oranges and yellows. Their leaves were scattered across the ground around us. 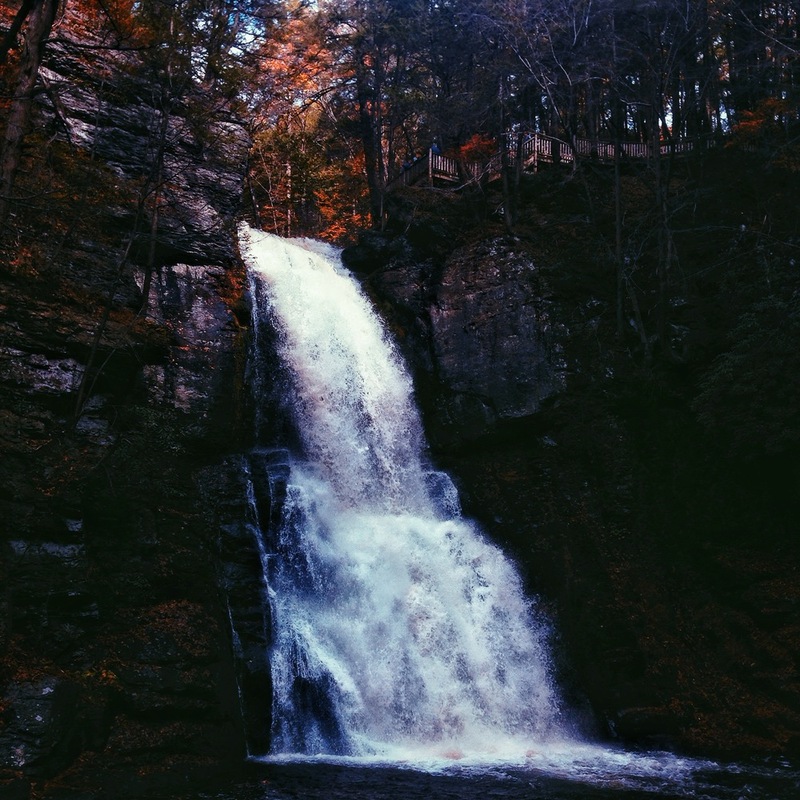 Bushkill Falls happens to be a very affordable place to take a day trip too. To fill up Gloria's gas tank, we spent a little less than $40, which got us all the way to Ithaca. Adult tickets for full access to Bushkill Falls cost us $12.50 each. Throw in some breakfast and the two of us each spent about $30 for food, travel, and access to the Bushkill Falls' nature trails. Honestly, I would be willing to pay more than that for the beauty we were able to view on those trails. There is nothing as peaceful or calming as watching the stream of a waterfall. At any angle we viewed it, I immediately felt sedative and relaxed. My New York City bred worries were pushed to the back of my mind. Between snapping photographs of the amazing sights throughout the trail, I would look back at Gloria who was similarly smiling between snapping photographs and enjoying the scenery. After a few hours of hiking around Bushkill Falls, Gloria and I enjoyed a few slices of pizza at the park's refreshment center and then excitedly hit the road towards Ithaca. By the time we reached Ithaca, it had become colder, darker and kind of rainy. Despite the unfavorable weather conditions, the friendliness we were welcomed with at Firelight Camps as well as the accommodation found on the property quickly eradicated any discomfort we felt once stepping out of the car. To check in, we entered into a large white tent in the center of the campsite. The tent, lit with little lights that resembled those that fireflies produce, beautiful wooden seating, a bar, and some treats including a gourmet smores kit, I found incredibly inviting. Even in the cold, I could sit there with a glass of wine and just relax the night away. There, we met Anna, who's positivity and excitement for both Firelight Camps and Ithaca was infectious. She greeted us with smiles and a wealth of information on the site and the area it inhabits, afterwards she happily lead us to our tent. The tent, as expected, was barely lit. The only source of light came from the headlights given to us upon our arrival and the few lamps scattered throughout the tent's interior. This may have been the only typical attribute of this campsite's tent, everything else was pretty unbelievable. Can you imagine a king size bed in the middle of the woods, sheltered only by a canvas ceiling? Well, there it was in all its glory. A king size bed, a beautiful persian rug underneath it, a charming little desk in the corner, a comfortable futon, and a hip looking rack to hang your clothes on, made this tent easily far more glamorous, spacious, and just overall better than the tiny room in Brooklyn I pay an arm and a leg to inhabit. Surprisingly, the amenities this tent provided don't end with the aforementioned list of amazingness. The tent also had a wonderful balcony, complete with two chairs for sitting and sipping coffee on while overlooking Ithaca's gorges and autumn trees (which, we definitely did). Additionally, the one worry we had once we got to Ithaca was being able to stay warm while camping outdoors and that also immediately became a non-issue. The room offered a mobile room heater, which worked to perfection, in addition to a chest that stored extra pillows and warm blankets. After a glass of wine, it was one of the best sleeps I had in a very long time. After a busy day of hiking, driving, and socializing, nothing sounded quite as nice as a morning at the spa. One of the greatest things that Firelight Camps has to offer over any ordinary campsite is access to August Moon Spa, which is a part of La Tourelle, the hotel that shares the surrounding land with Firelight Camps. Gloria and I were treated to two luxurious hour long, deep tissue back massages there. Like most spas, we were given robes and lead into our individual rooms where serene music played and a lovely masseuse pressed all of the stress out of my body with her magic touch. Afterwards, I was informed that all the products utilized during the massage were August Moon Spa's own. Another interesting fact about these products is that the herbs found within them are grown right on the La Tourelle property. In fact, many of the beauty products and goodies for sale at both Firelight and La Tourelle are locally grown and sourced, which of course appeased the Brooklyn hipster in me. After our massages, Gloria and I met in what August Moon Spa coined "The Tranquility Room," and tranquil it sure was. We laid on love seats while drinking warm tea, remarking on how relaxed we felt and how distant our stresses we came to Ithaca with now felt. We were so comfortable there that our plans to explore Ithaca's waterfalls that day were completely nixed. We knew we would absolutely come back someday to explore them, but today called for relaxation and becoming more familiar with Firelight Camps so we didn't mind missing out on Ithaca this time. Once we left August Moon Spa, happy and relaxed, Gloria and I made our way to the central tent at Firelight Camps for a late breakfast. There, a plethora of amazing bites were available, all made by the wife of Firelight Camps' founder, Food Network Star and blogger, Emma Frisch of Frisch Kitchen. Needless to say, breakfast, which consisted of a range of savory scones, sweet granola, yogurt, and fresh fruit was amazing. After we finished the meal, we were also offered Firelight Camps' signature treat, smores, which included handmade cinnamon flavored marshmallows, also crafted by Emma Frisch. Though it was broad daylight, Gloria and I enjoyed this sweet treat by the fire with some hot chocolate because what is camping if you don't get to make smores?Quite soon, we were joined at the fire pit by the founder of Firelight Camps, Robert Frisch. Surprisingly young, with an energetic spirit and eager to speak on his passion project, was Frisch, who had quite the interesting story. Inspired by the eco-lodges he stayed at while a Peace Corps volunteer in Nicaragua, Frisch, who garnered his MBA from nearby Cornell, developed the idea for Firelight Camps. He wanted to combine the experience of sleeping outdoors with the luxury you can find while staying at a hotel. Thus, the idea for Firelight Camps, a "glamping" (glamorous camping, duh) site was born. With the help of fellow Cornell MBA grads and his wife, the first Firelight Camps was completed and opened this year for the end of summer and early fall. Despite only being open for a few months, Firelights Camps, as expected, has already garnered the ultimate seal of approval. Yes, I'm talking about a shout out from Vogue. Though, despite being written up about in the premiere fashion bible, you could easily turn a road trip to Firelight Camps into an easy and affordable trip. Gloria and I did the calculations and Frisch confirmed - it's doable and has definitely been done with an enjoyable outcome. For one night in a Firelight Camps luxury tent, the total cost of $275 per night can be split amongst four for less than $70 each. There's definitely enough space for it. With a king size bed and a large futon, everyone can easily have enough space to sleep comfortably. Depending on the type of car your driving, the roundtrip gas fee from New York to Ithaca per person averages to around $20 each, which is much less than a bus or train can get you there. Lastly, food in the area is not as expensive as it is in our big and bustling city. Gloria and I enjoyed a three course meal complete with appetizers and alcoholic beverages in town for less than $15 each. Around town hiking fees are also incredibly low. Firelight Camps has made getting on one of these tours even easier by partnering with local tour guides. Lastly, if you do want to splurge, a massage at August Moon Spa is definitely worth it. Overall, it was an amazing trip that did not break the bank and one that Gloria and I definitely plan on doing again in the future, but, as we agreed amongst ourselves, definitely with future boyfriends. For more information on Firelight Camps be sure to visit their website! They are closed during the winter season, but will reopen late spring. Frisch also promised that another Firelight campsite may be on the horizon and much closer to New York City. You have no excuse not to go visit!